Painted popcorn ceilings can be very easy to remove! Yeah I just said that. 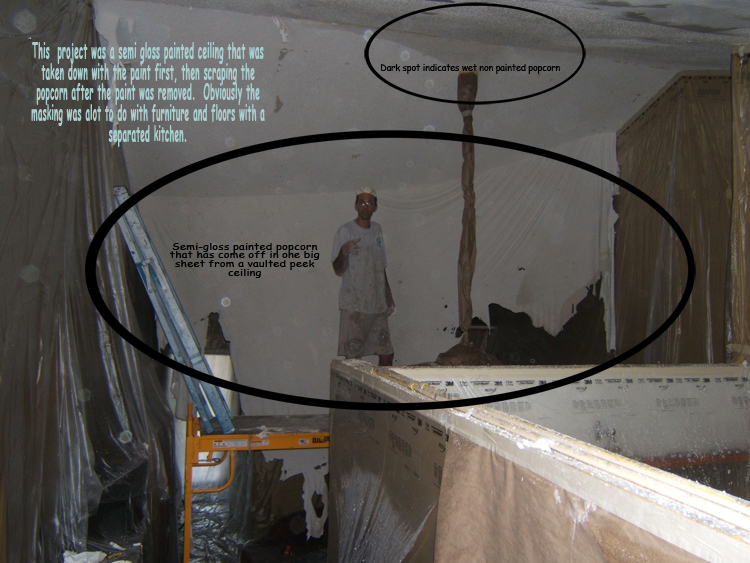 However, painted popcorn ceilings can be very very very hard to remove as well. Several factor will determine how difficult this will be. To first determine if your ceiling is painted, you will need to wet it with a sprayer of some kind. Either a tank sprayer or a garden hose. We will assume that you have taken the necessary precautions to make sure there is no asbestos in the ceiling of course. When you wet the popcorn, in 99.9% of most cases, if there is no paint present, the water will change the ceiling a darker shade then what it presently is. If any paint is present, the water will probably hit the ceiling and alot of it will bounce back onto you, drip down. Most non painted popcorn ceilings can be rubbed off with your finger and leave a residue when it is wet, but the painted ceilings do just the opposite. They leave virtually nothing on your finger. This is were your problems will begin.